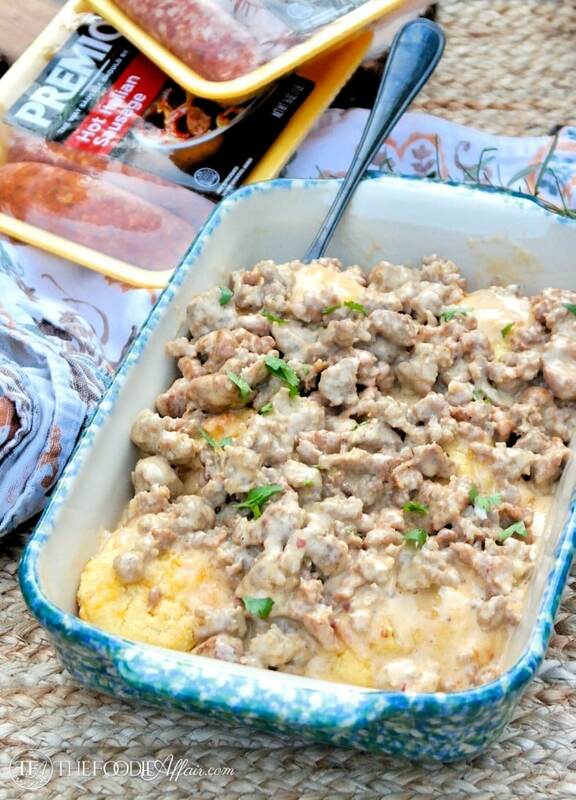 Low carb biscuits and sausage gravy sauce is easy to make and will keep you satisfied for hours! Perfect meal for powering though the day! Pure comfort food low carb-style is on the menu! 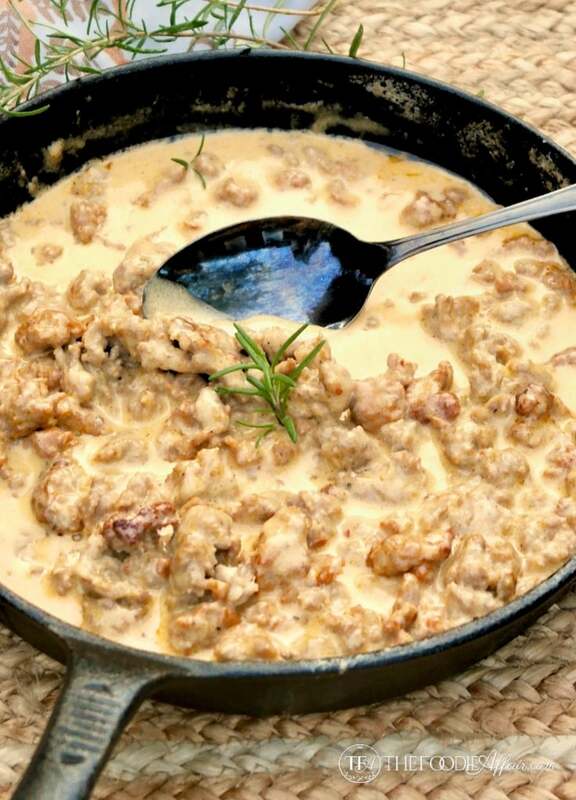 Even if you aren’t following a low carb diet this low carb biscuits sausage gravy is satisfying and filling! Just the meal you want this time of year, because aren’t you in full energizer bunny busy mode? I know I am! This past weekend Alan and I put up our Christmas tree, which I LOVE to pieces. It’s the perfect size for our small living area and I added ribbon to our tree this year, which looks better than I thought it would. I’ll have to share a photo! Not only did we get the tree up, but we decorated the house too! In past years I have been pretty ambivalent about pulling out all the Christmas boxes stored with years worth of decor. It’s a lot of work, right? When our kids were young we went all out! Every room was cheery with the holiday spirit. Even the kid’s rooms were decorated with mini artificial Christmas trees. Sam’s tree had a sports theme going on with itty-bitty ornaments of baseballs, footballs, and basketballs. Ashley’s tree was glittery and filled with tiny purses and shoe ornaments! Super cute, but these days the Christmas decorations are pared down quite a bit with just enough to make the house cozy and festive! 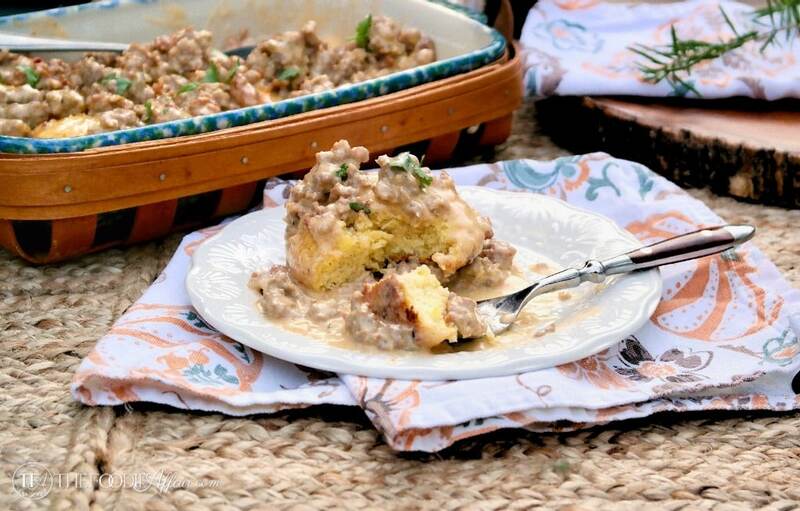 If you haven’t dug into your holiday decor, I have just the low carb biscuit and sausage gravy meal you’ll want to eat before climbing the rafters! 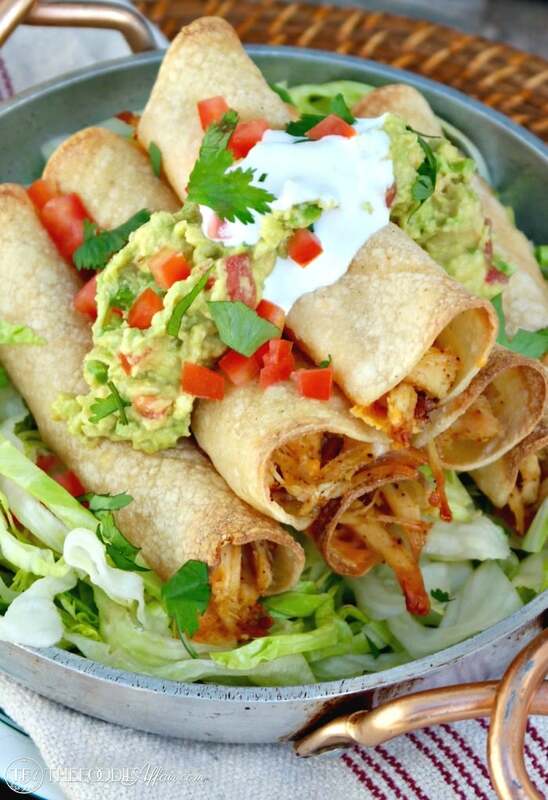 This dish will give you the energy you’ll need for digging through all those boxes! 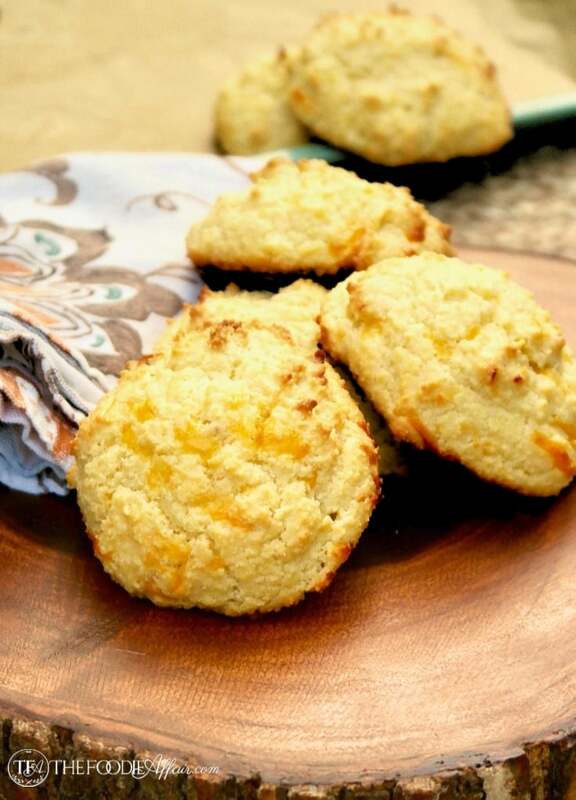 Start by making these low carb cheddar biscuits. The recipe makes eight drop biscuits and they’re only 2 carbs each. For this recipe I made the biscuits larger so that I could have six substantial servings. The low carb biscuits only take about 12 minutes to bake. While letting those cook up break out the skillet and start cooking the sausage. Even Alan asked, “What kind of sausage did you use? It’s super flavorful!” I have since learned that Premio doesn’t use filler in their sausage, which makes a BIG difference in the quality of meat we consume, guys! In addition, I didn’t need to add any seasoning to the low carb gravy sauce! The sausage provided all the flavor it needed. You can use bulk sausage or links. I took the casings off of links and left some big chunks mixed up with small pea sized pieces. Serve right out of the skillet once you make the gravy sauce or place the biscuits in a baking dish, then top it with the sausage gravy. Comfort food low carb style! 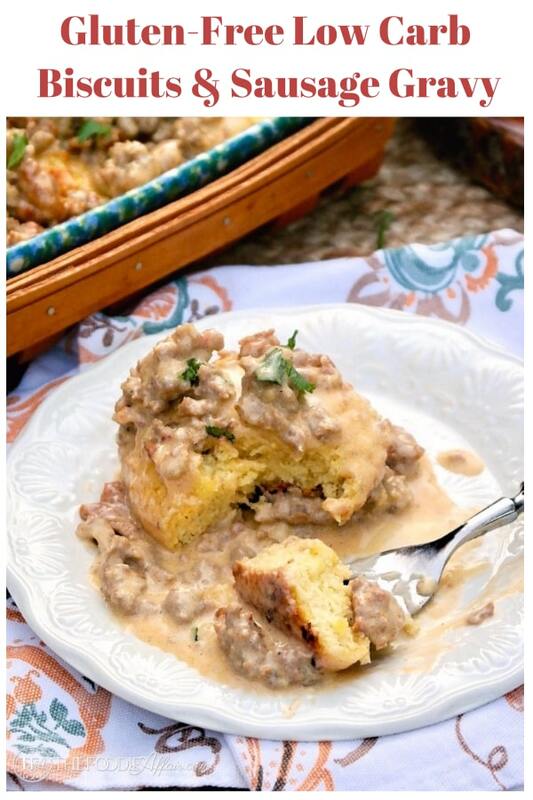 Filling and easy biscuits and sausage gravy sauce recipe! Make low carb cheddar biscuits and set aside. In a medium saucepan cook sausage in two tablespoons of butter until the meat is no longer pink. Break up the sausage into the size of pieces you prefer while cooking. Once meat is cooked, drain fat if there is more that a couple of tablespoons left in the pan. Add cream and water and simmer for about 12 minutes. Remove one tablespoon of the sauce and place it in a small bowl to cool. Once cool, whisk in the arrowroot, then return to the skillet whisking in the sausage mix. Bring to medium-high heat and once the sauce thickens and begins to bubble, remove from heat. Add remaining two tablespoons of butter and stir until incorporated in the sauce. Place the biscuits in a baking pan. Pour sausage gravy over the biscuits. Place in the oven at 350 degrees and cook for 10 minutes or until the biscuits are heated. I used a mix of sweet and hot sausage. Adjust to your preference. This is comfort food at its finest! Yummy! I am having some serious breakfast envy. Love how you’ve improved this classic by making it low carb AND gluten free. Excellent! I keep meaning to get round to trying US style biscuits, they are very different to anything we have no this side of the Atlantic… Looks good. Yum! This is total comfort food! Love that you made this low-carb. Pass me a plate please! Oh I love biscuits and gravy, this will be a great breakfast for Christmas morning! I’m loving the holidays and all the decorating – can’t wait to see a picture of your tree! I love what you did with such a classic comfort food! Looks great! 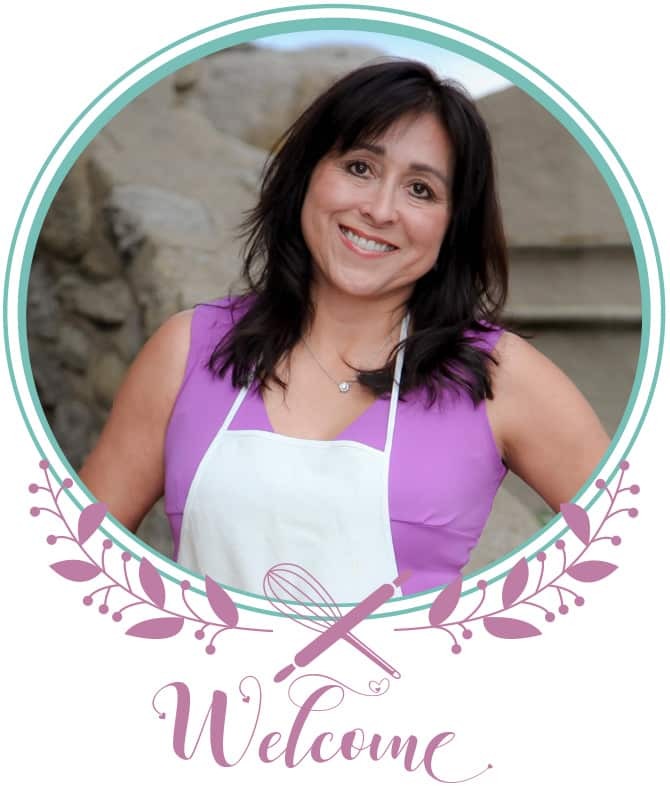 Way to lighten up something delicious and yet always so caloric! This looks like the perfect comfort food for any meal of the day and I love that you’ve lightened up the carbs! We don’t decorate like we used too. I love everything out but not putting it all away! This sounds like the ultimate comfort food! Biscuits and gravy are so tasty! 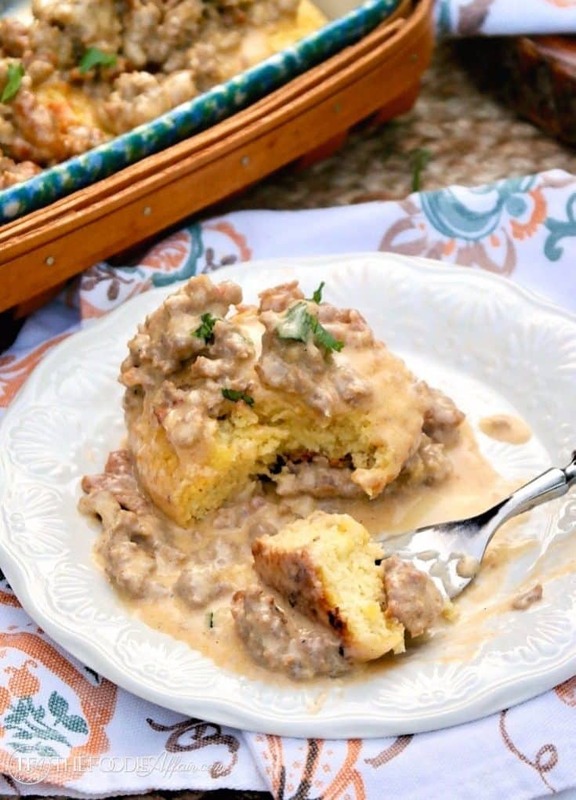 Biscuits and Sausage Gravy sounds super delicious right now! What a warm and wonderful dish! Oh man, this is enough to make me want to do a low-carb diet. It looks seriously delicious!